I'm ending the month of May having completed four books total, however some of them were started before the month itself began - I managed to clear up some books that had bookmarks sitting in them for a while. Yay! I started May on the right footing by reading a review book that is due to be published this month, in June: Secrets of Southern Girls by Haley Harrigan. My experience whilst reading this title was a mixed bag, ultimately rating the debut novel 3 out of 5 stars. I'll be sharing a full review next week. 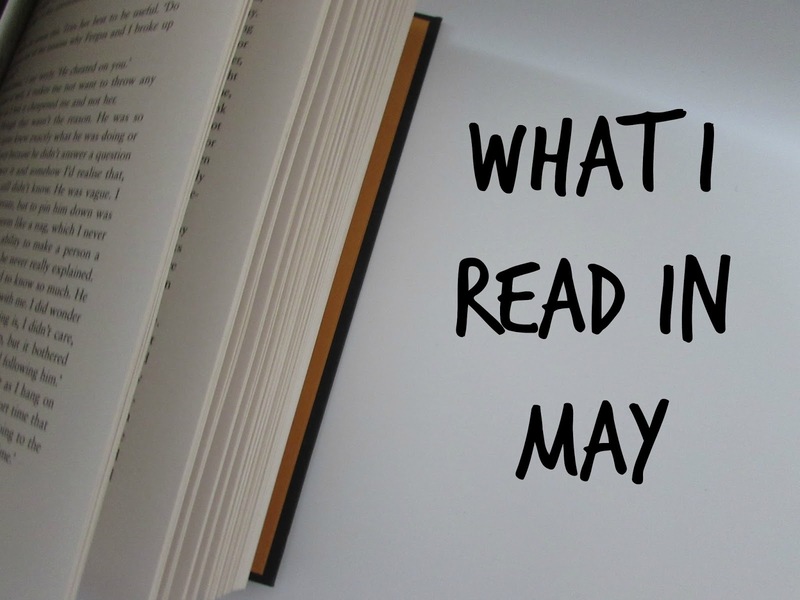 Having thought by starting the month in a productive manner, feeling like I was over my reading slump and also getting ahead with review books, I imagined May to be a great reading month for me... However that turned out not to be the case, as I didn't pick up another book for a week or so after completing my first read. I thought my reading slump had returned, which wasn't a great feeling, however ultimately I think I just needed to relieve myself of some pressure. I didn't push myself to blog here, despite wanting May to be my month of returning and consistently blogging, and I also decluttered my bookshelves for the third or fourth time this year. I was brutal with this declutter and my minimal book collection is now even smaller. I felt better for it though, and happily returned to reading the very next day. I know I've been going on about this slump of mine - reading & blogging - for a while now, and I am sorry for harping on about it so often. Not only the slump but also the negativity I've been feeling with books and my own book collection, however I think it important to document these thoughts for my own record, as well as acknowledge when something you know and love just isn't feeling right for you in a given moment. Anyway... Back to the other books I managed to read in May. The next book I completed was Tales of the Peculiar by Ransom Riggs. I was drawn to this book and its stunning book cover in a bookshop, and was a little hesistant about buying it having not finished the series of Miss Peregrine's Peculiar Children, but those worries were not warranted as this book is readable even if you have next to no knowledge of the series. The stories were short but well told and are akin to the fairy tales we know from childhood, with beautiful illustrations peppered throughout. Overall I rated Tales of the Peculiar 4 out of 5 stars. Another short story collection I read in May was The Bazaar of Bad Dreams by Stephen King - I'd had a bookmark in this title for a couple of months now, picking it back up at the 80 page mark (so very little read). As with any short story collection, some of the stories were enjoyed more than others, and I do hope to write a full review in the coming weeks. Another 4 star read. I ended the month, and by ended I mean literally finished this yesterday evening, with The Secret Library by Oliver Tearle. This is a non fiction title that I've had a bookmark in since February, but one I wish I had finished a lot sooner. Much like other books mentioned here, I do intend to share a full review of this title, however if you're keen on books about books then this is one for you. 5 out of 5 stars. I hope your slump gets better soon. I didn’t read much in May, either. The weather is getting warmer, so I’ve been spending time outside. Happy June! It's lovely being able to really enjoy the outdoors now that the warmer months are here. Wishing you a wonderful month of June! It always feels good to finish those lingering books! You'll get back in the groove of things when the time is right I'm sure. Thanks - those lingering books so easily mount up when finicky with book choices. Wishing you a wonderful June, Christine! They were great reads - starting June on good footing. Wishing you a lovely June! The Secret Library sounds good! Books about books are the best! A great read - I'd recommend it, Julie! Happy June! Ah good to know you are back on track. Sometimes a good tidy up of shelves and culling of books just gives the oompf to get going again. All the best for June. It sure has given me the boost I needed, Kathryn. Thank you, and a lovely June to you too! Reading and blogging slumps are the worst. Sometimes a break is necessary to prevent burn out. I suffer them frequently. I'm glad you had some enjoyable reads this month. Thanks, Brandie. Wishing you a wonderful June! I think blogging sometimes comes and goes in terms of mood or whatever so I definitely relate to that. And then reading slumps too... they're such a pain. :) May wasn't that great a month for me either. But hey there's always June right? I've been kinda wanting to read the Riggs books but just haven't found the time... sigh. They're a pain alright! Haha! Happy reading in June!